Kusems L. Poppington: Pi(e) Day 2013! I woke up Monday morning and for some odd reason, my brain thought, "It's the 22nd of July." I'm not normally one to mark the date as I wake up, so I'm not sure what triggered this, but my next thought was, "It's Pi(e) Day!" Outside of America, dates are written with the day first, and then the month, so March 14th is 14.3, not 3.14. Non-American nerds were sad to miss out on Pi(e) Day, so they designated 22/7 as Pi(e) Day, because 22 / 7 = 3.142857, which is close enough to Pi. 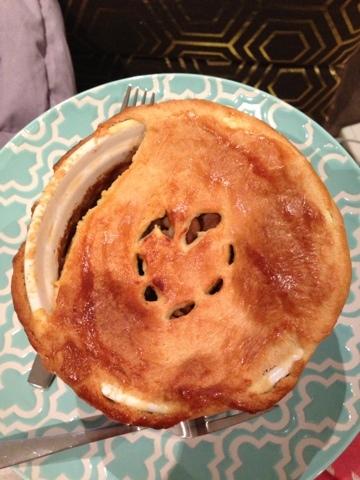 Anyhoo, I made a chicken and mushroom pie for dinner! Yay! There was a bit of pastry left over, and I had some frozen berries, so I chucked those in to a pie plate, added some double cream, and put the pastry lid on. Now, I knew that I should cook the frozen berries first. I knew they were full of frozen water that would make my "pie" watery. But I couldn't be bothered. 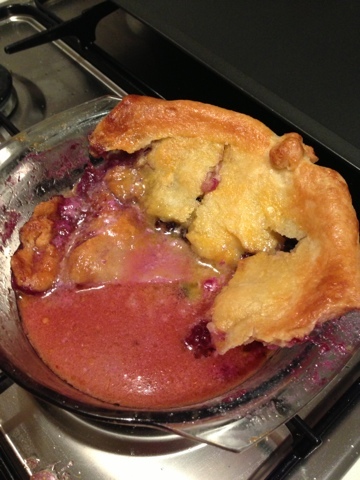 So I made some berry soup, with a soggy pastry topping! I'm so talented. Your pie crust looks DELISH!!! Huh! I never knew about the "other" pi day. Cool! And that first pie looks good. Holy smokes. I'm sure the second pie tasted good, too.